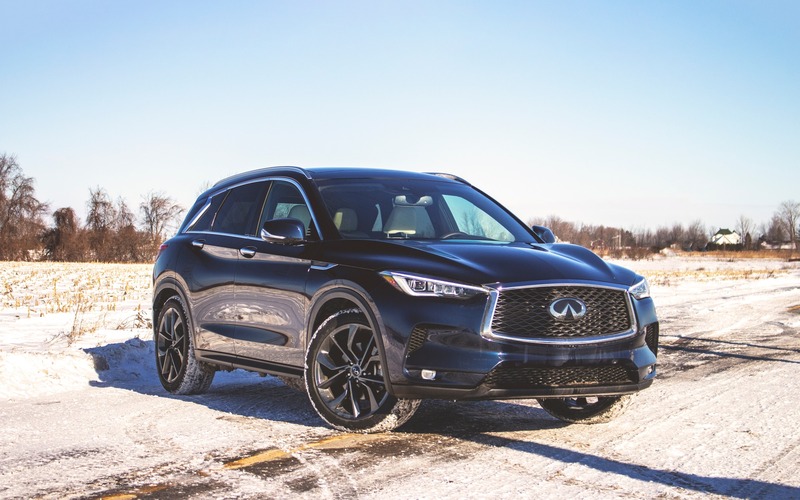 The 2019 Infiniti QX50 is all-new from the ground up and armed, at least according to Infiniti, to tackle on the latest crop of compact luxury crossovers out there, which have now become all the talk in the industry. It features the first-ever variable-compression engine… in the world. Thanks to trick and, frankly cool engineering, this turbocharged mill promises to significantly improve fuel economy, all while delivering substantial performance. It’s the kind of talk we like to hear from a carmaker; innovative technology that allows a specific vehicle to stand tall next to its rivals. We took one out for drive to find out how this VC-Turbo business feels behind the wheel. 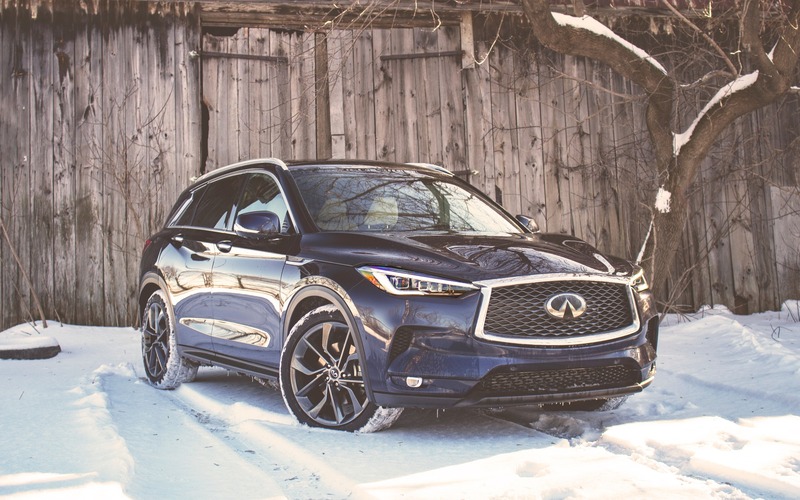 Infiniti’s newest crossover is the brand’s first vehicle to have been designed by Montrealer Karim Habib. He cut his teeth over at BMW, leading stylish vehicles such as the BMW 7 Series and 5 Series, as well as the brand’s first all-electric car, the i3, not forgetting the i8 hybrid supercar. Under Karim’s stylistic management, Infiniti promises to finally have an identity of its own, something it’s been lacking for quite some time now. With recent concept cars like the QX Inspiration, unveiled in Detroit in January, we’re seeing where Karim is heading, and we kind of like it. This is also why the QX50, while a tad too subtle, is without question a fantastically well-designed little SUV. It has an elegant and organic silhouette that plays well at making the vehicle appear luxurious, but not too flashy, nor pretentious, all while retaining actual compact dimensions. However, we fear it’s not enough for the Audi/BMW/Mercedes-Benz crowd to take notice. From some angles, the QX50 kind of resembles (whispers) a Mazda CX-5. We’re not sure if that’s a compliment, or an insult. At least, it’s significantly more coherent-looking than the old QX50, which had more or less a wagon-type demeanour. But that vehicle had other tricks up its sleeves. While unsophisticated, it rode on a platform sourced from Nissan’s own Z car. Its engine was also taken straight out of the aforementioned sports coupe. And its all-wheel drive system was once bolted onto a so-called Nissan Skyline GT-R over in Japan. It was a different kind of crossover. But that’s all in the past now. This new QX50 ditches the quirky traits of its predecessor for a more mainstream package. Its platform is new from the ground up, quieter, more solid and a lot more spacious inside. Its all-wheel drive system is now front-wheel biased, with a transverse four-cylinder engine sitting under its hood. And its gearbox is a continuously variable automatic. It’s the engine that gets all the attention now. At two litres of displacement, it’s turbocharged and fitted with direct fuel injection, pumping out 268 horsepower and 280 lb.-ft. of torque. It’s a marvel of engineering, capable of changing its compression ratio on the fly, from a low of 8.0:1, to a high of 14.0:1. According to Infiniti, it has taken 20 years to put this thing onto the market. It’s the first of its kind, allowing, says the carmaker, for the engine to run in maximum efficiency, burning very little fuel when running quietly, or running at 22.0 psi of boost when at full throttle. On paper, the system is rather clever. Extra pieces were added to the crankshaft for solidity. There’s now a joint between the crankshaft and the connecting rods. That joint moves with a computer-controlled arm. By doing this, you not only allow variations in compression, but also in stroke—by 1.2 mm—which alters the engine’s overall displacement, from 1,971 cc (14:1 compression), to 1,997 cc (8:1 compression). 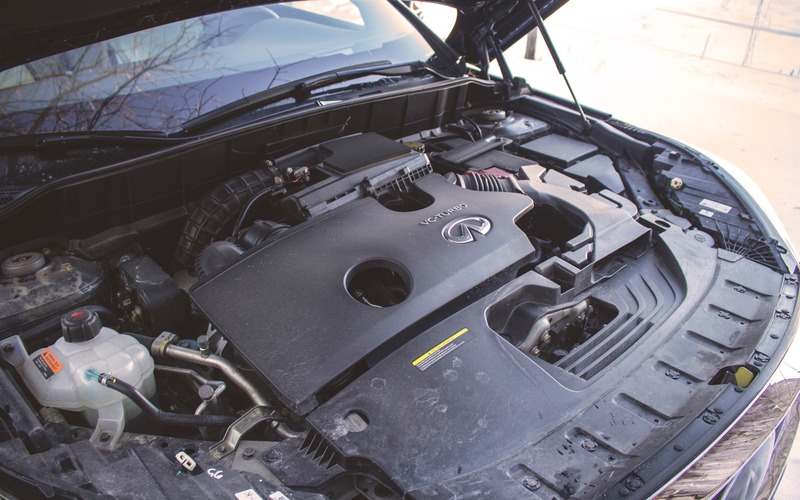 It’s indeed a daunting feat, and we’re happy Infiniti went through with it. But while we’re geeking out on the technology, it turns out that it’s not all that substantial out in the wild. While we had the vehicle, during winter, the best fuel economy average we recorded was 9.5 L/100 km. That was in Eco mode, feathering the throttle. While good, that number isn’t significantly better than what you’ll get from a traditional turbocharged 2.0-litre four from, say, an Audi Q5 or an Acura RDX. Heck, we got almost similar numbers out of a V6-powered Honda Pilot. And the system is so darn seamless behind the wheel that none of this innovative trickery actually plays through to the driver. It also gets quickly overshadowed by the relentlessly drone-y engine note and the elastic feel of the CVT gearbox. To its credit, the VC-Turbo engine is peppy, and when running full swing in Sport mode, it revs fast, providing impeccable pickup and more than decent acceleration. But it’s all ruined by the transmission which, we’re sorry, doesn’t belong in a luxury vehicle. On the road, the QX50 demonstrates fantastic chassis calibration. It feels solid, nimble and reacts rather well to driver commands, but that steering wheel, not connected to an actual rack-and-pinion system (like the one found in the Q50), is absent of life or any sort of resistance. It basically feels like it isn’t connected to anything. That’s because it isn’t. There’s hope, however, for buyers who care not about driving dynamics, or engineering. 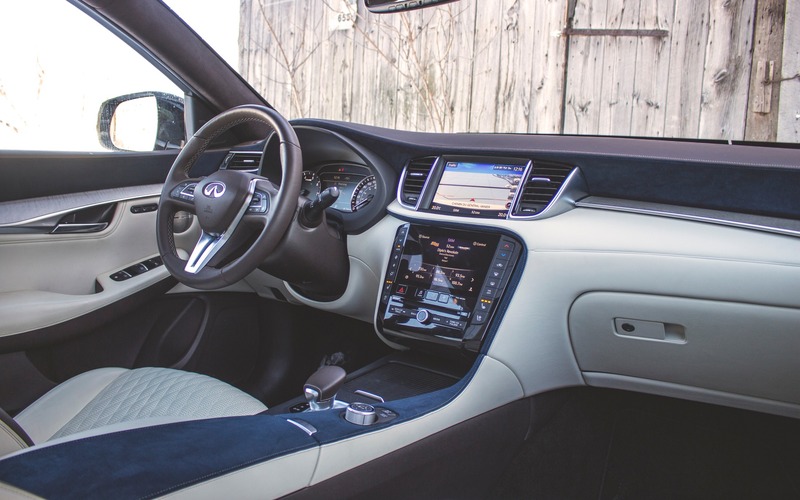 The cabin is well put together, and there’s a clever use of materials, such as the quilted leather seats that help it shine as a luxury vehicle. But we’re so not sure about the mashup of colors—blue, brown and white—our Autograph variant was fitted with. Its rear bench, adjustable both in tilt and slide, is spacious thanks in part to a flat floor. And its trunk will engulf 1,822 litres of your gear once all seats are folded flat, placing it right smack between an Audi Q5 (1,550 litres) and an Acura RDX (2,260 litres). Infiniti’s two-screen infotainment system remains a complex bugger, especially when comes time to turn on the heated steering wheel, which requires entering the Climate menu, and clicking the touch-operated command, which doesn’t work with gloves on. The heated seats, on the other hand, have their own physical button. 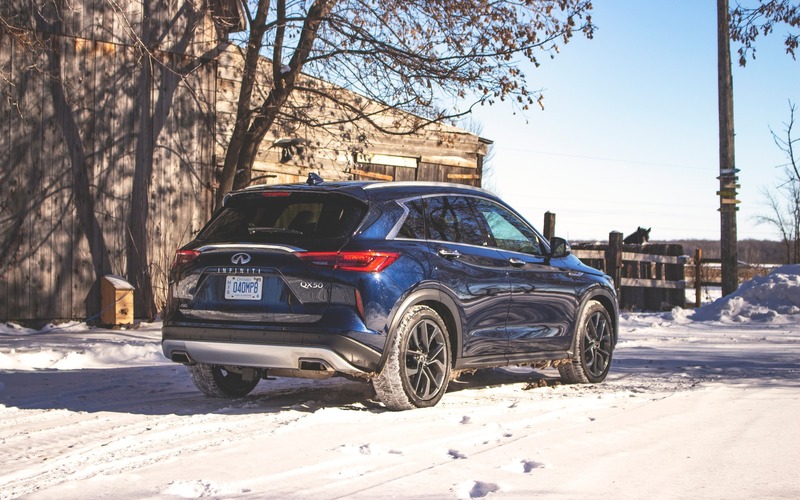 Overall, there’s a lot to like about the 2019 Infiniti QX50, and there’s finally a sense the brand is aligning itself with an identity all of its own. But that VC-Turbo deserves a lot more attention, let alone actually do something for consumers. As a whole, there’s appeal, but we fear it’s already getting eaten up by the other new kid on the block, the redesigned Acura RDX. 7/10	We recorded an average of 9.5 L/100 km, in winter. While good, it's not significantly better than rivals with standard turbo engines. 10/10	The QX50 has a roomy cabin, with comfortable seats front and rear. 6/10	The engine is peppy and the chassis calibration is on point. But the steering feel is numb, and the CVT ruins the party. 6/10	While fitted with all the toys, the two-screen layout can get confusing. Some simple commands require several steps. 9/10	There's a nimble, sporty feel behind the wheel, allowing the QX50 to be a spirited performer when put through its paces. 7/10	It hits strong on some important points, but as a whole, the QX50 gets quickly outgunned by some of its direct rivals.